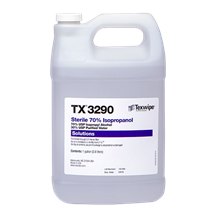 Texwipe’s sterile and non-sterile 70% Isopropanol (IPA) contains 70% USP-grade Isopropanol (Isopropyl Alcohol) and 30% USP-grade purified water. The solution is submicron filtered, filled into cleaned containers and double-bagged. Each bottle is lot coded and has an expiration date. • Filled in an ISO Class 5 environment. • 0.2 µm filtered and packaged into cleaned containers. • Double-bagged in solvent-safe bags. • Evaporates leaving low residue, no rinse required. • Trigger sprayer bottles are fully assembled and ready-to-use. • Trigger sprayers offer stream delivery or coarse spray. • Meets USP <797> and USP <800> requirements. • Individually lot coded for ease of traceability and quality control. • Surface cleaning and residue removal. • Cleaning gloves, notebooks, phones or any other item entering the cleanroom. • Wipe down for pass-through to controlled environments. 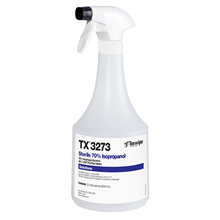 • Ideally suited for use with Texwipe Cleanroom wipers. • Certificate of Compliance, Analysis and Irradiation attached to each case. • Gamma irradiated to a Sterility Assurance Level of 10-6 according to AAMI Guidelines. 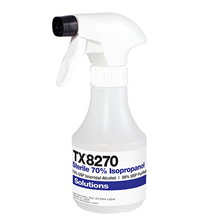 70% Isopropyl Alcohol, Sterile Note: Item cannot ship by air freight.